Katha UK announces with regret the sad demise of noted Ghazalkar, Story writer and journalist Shri Mahavir Sharma. Mahavir ji had been suffering from Colitis for some time. For the last two weeks he was in hospital. The end came at 01.30 hrs of Wednesday the 17 November 2010. Senior Ghazal stalwart Shri Pran Sharma was also actively involved with the blog. Mahavir Ji provided a platform to majority of Hindi poets and ghazalkars settled outside India. His death has left Shri Pran Sharma a sad man who remembers Mahavir ji with fondness. Deepak Mashal, a young poet from Belfast was crying profusely when he broke the news to me. 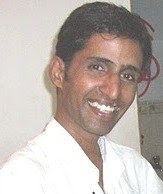 To check about the last rites of Mahavir ji, please contact his son Raj Sharma at his mobile: 07580250639. Katha UK and its members pay homage to the departed soul.